Remember this peach crisp that I made back when it was still light at 5pm and peaches were ripe for making crisp? 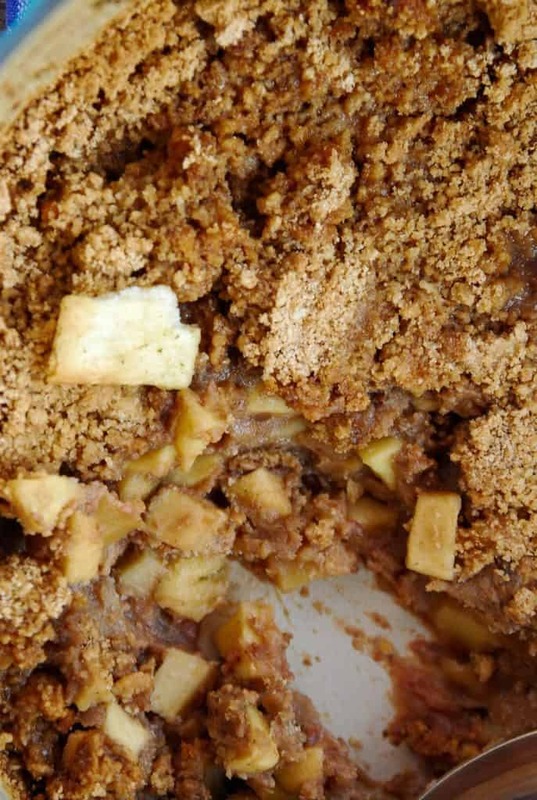 This is just like that, except with an addition of caramel and apples in an easy vegan apple crisp! When I started food blogging, I never ever thought I would be standing out on my weathered front porch, taking photos of a dutch oven full of apple crisp at 8AM in 29 degree weather. (But as Dara from Cookin Canuck pointed out, that would make me a ‘frosty vegan’, ha!) Never ever. I always assumed that bloggers captured such beautiful photos because they all lived in houses with marble counter tops, subway tile back splashes and shot with the nicest camera money can buy. While this may be true for some very lucky individuals, I came to find that this is not true for me. Those marble counter tops were made with tiles bought from Home Depot and the pictures captured may very well have been taken with the handy, useful camera on an Iphone (which takes pretty dang good pictures). 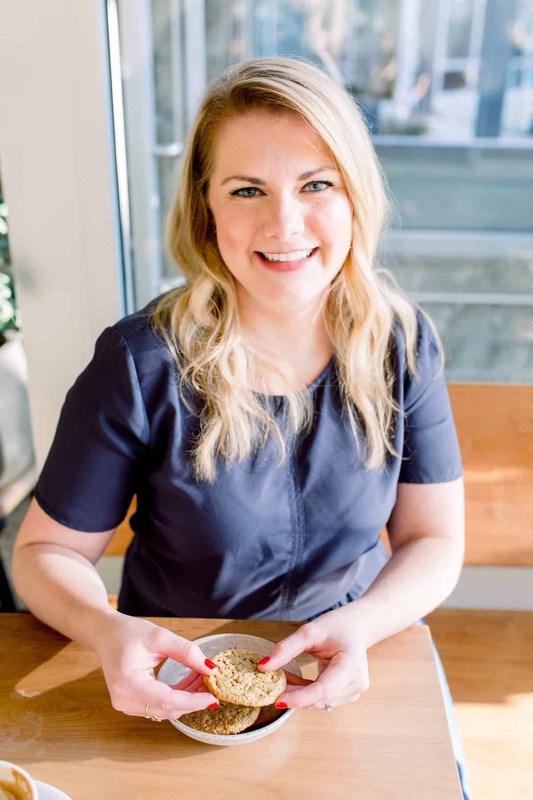 Food blogging has been something that I’ve come to adore and love, and have found that it makes me do slightly crazy things. Stand on a chair with one foot on the dining room table to get that perfect overhead shot? Done. 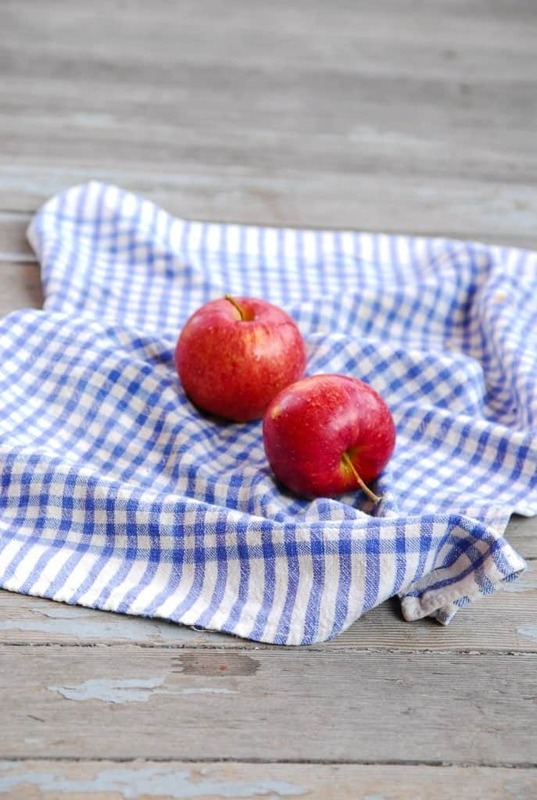 Pick a perfect apple with the perfect stem/leaf combo attached for picture purchases? Double done. (Except in this case, my finace thought I wanted the stem removed so he picked it off while I was picking other apples, to which I was all ‘why did you do that?! I picked that one for pictures!’). The other thing food blogging has forced me to do is step outside of my comfort zone while developing new recipes. While this caramel apple crisp is not outside of my comfort zone, adding the streusel topping happened to be a stroke of genius that I am so glad I ended up doing. Normally, I probably would have just made a simple apple crisp or a plain apple pie with all the apples we came home with from the apple orchard a few weeks ago. Not that there is anything wrong with either one of those desserts, but since I like to come up with new recipes on a regular basis, I knew I needed to add a little something extra to my apple crisp. If you have been around here long enough, you know that I’m a huge fan of date caramel in everything; on oatmeal, in smoothies, in ice cream, I’ll take it all! Adding my favorite date caramel to an apple crisp and streusel topping? Well that is a no brainer. 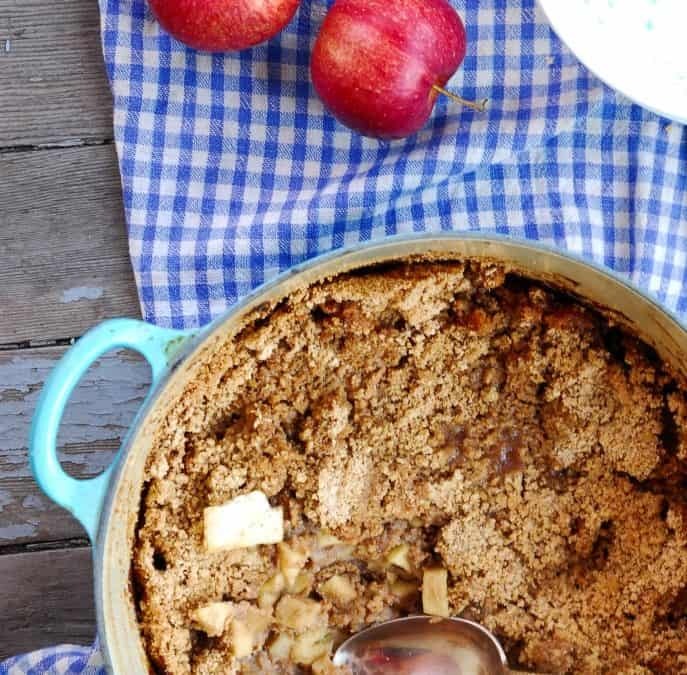 Once I started scooping out the warm caramel apple mixture and trying to find a way to pick off more of the crunchy and sweet streusel topping, I knew this was destined to be a fall dessert staple in our house! 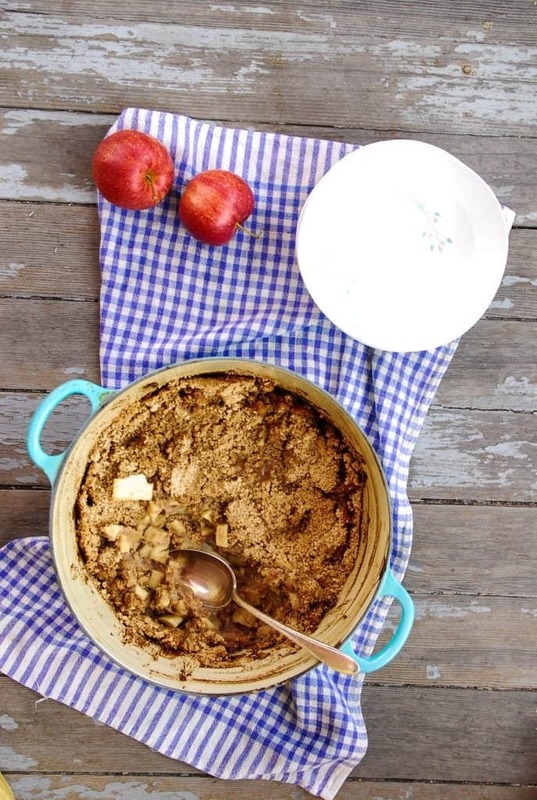 I’m glad blogging forced me out of my comfort zone and into a bowl of this apple crisp goodness. p.s. Did you notice? We have a new look! I wanted to create a more streamlined and cleaner look in the new blog design. Let me know if you see anything that should be fixed or have suggestions for what you would like to see/improvements! In the bowl of a food processor, combine all the ingredients for the date caramel. Process until smooth and creamy, which could take a few minutes. If needed, scrape down the side of the bowl and add a bit more almond milk to keep the caramel going in the food processor. Set caramel mixture aside. Preheat oven to 350 degrees F, grease a dutch oven or large casserole dish and set aside. In a large bowl, combine the ingredients for the filling, including the spices. Mix in all of the date caramel sauce. In a smaller bowl, combine all of the streusel topping ingredients and mix together with your hands until a crumbly topping has formed. Transfer filling mixture to the greased dish and sprinkle with streusel topping. Bake for 30-45 minutes, or until mixture is bubbly and apples are tender. This is so great! I’ve been looking for something familiar, but also healthier for Thanksgiving this year. It’s just my husband and me, so I had to pick just one thing and I think this could very well be it! The caramel addition is genius and I’m getting tired of pumpkin everything, but I haven’t overdone apples yet, so thank you! HIGH MARKS FOR THOSE PHOTOS! WELL DONE. Thank you Kathleen! Apples seem to always get the shaft right when pumpkin comes in season, right? Give me allll the apples! You could put streusel on dirt and I’d eat it. This looks amazing! I agree, the topping is always the first to go! Thank you dear! Glad you like the new layout, it took a bit of work, but I like it! Glad to know that I’m not the only one without perfect marble counters! 😉 I can totally relate to all your blog-adventures. You wouldn’t believe how I rearrange my day sometimes to take advantage of natural light. 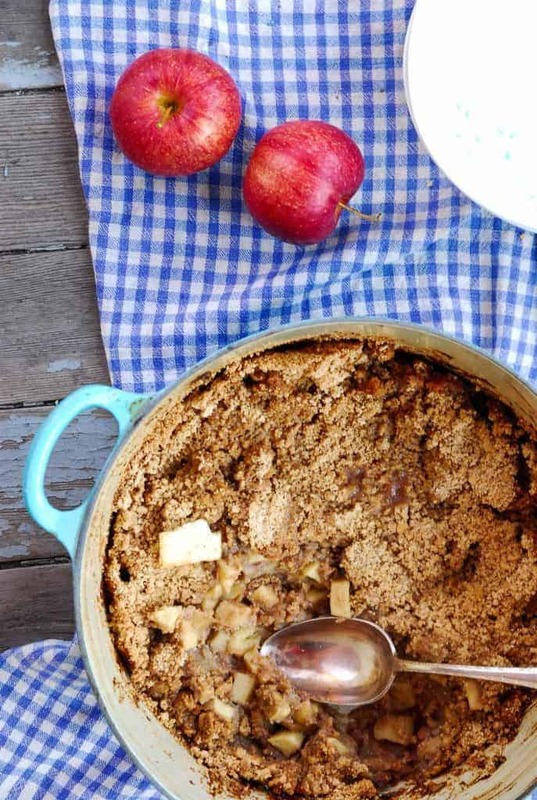 I am a HUGE lover of apple crisp and although I’m not a vegan myself, I have friends who are and I can’t wait to make this for them. Thanks Abby! Oh heck no! My weathered front porch did just fine 🙂 I hope you enjoy this, it’s so so good!